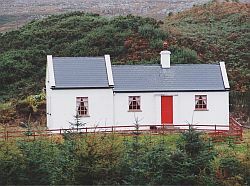 Our traditional Irish self catering cottages are situated in the scenic Fanad Peninsula in Donegal North West Ireland have been the homes to Michael and Margaret’s families for several generations. The original features have been carefully retained whilst subtly integrating modern comforts. A stay at the cottage will create for you the true atmosphere of the past way of life in rural Donegal. Our Donegal holiday cottages are located in peaceful rural setting in unspoilt countryside close to several beautiful sandy beaches, lakes, mountains, hills, cliffs and the rugged Atlantic coastline. 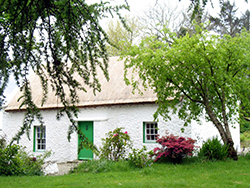 The family takes much pride and enjoyment in sharing our cottages with you and are happy to meet all your needs to ensure you enjoy your stay in their traditional Irish cottages. Thoughtful extras such as home baking, jams and selection of vegetables from the cottage organic garden will greet you on your arrival. Michael or Margaret will be at the cottage with the peat fire burning and have everything nice for your arrival and will be available throughout your stay to make your holiday in Donegal pleasant and memorable. Ardroe thatched cottage is included in Alistair Sawday's "Special Places to Stay" and in Guardian.co.uk "Twenty Special Places to Rent in Ireland"